You know what's great about opinions? We all have 'em! So here are a few of mine. 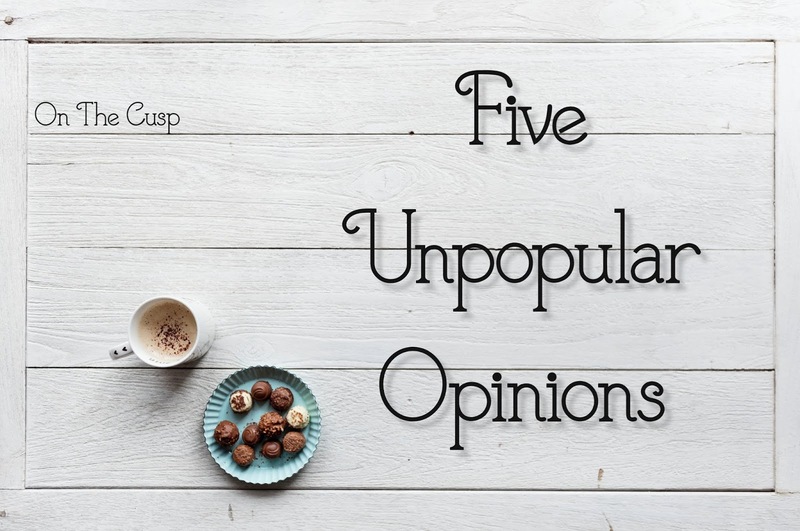 Feel free to agree or disagree and tell me if you have any particular opinions often considered "unpopular"! 1. Pineapple is the best pizza topping. Fight me. 3. Gender reveal parties are outdated and need to stop. 5. Drinking milk over the age of, like, five should be unacceptable. 2. Chocolate is not disgusting! I think I have a mild allergy to chocolate, so my opinion there is kind of personal, haha! And I don't eat cookies. I have a pretty low/no-sugar diet because I have to (yay, health problems....) but if I did eat cookies I'd likely dunk them in tea or coffee. Cream is nice in coffee or tea, but I can't imagine drinking it plain. That'd be so strange to me! 1 - YES, pineapple pizza is the damn best thing. 2 - Chocolate under 70% cacao doesn't deserve the holy name of chocolate. 3 - We are having a gender reveal for my friend after his top surgery, his request. 4 - As someone with THICK eyebrows, I found it nice to see people move away from the thin 2000's eyebrow. 5 - Agreed, milk is gross and weird. Thick eyebrows are totally fine, I'm talking about the sharply drawn "on fleek" brows that just look super unnatural, lol! And I definitely disagree with most of yours apart from the pineapple one. I love pineapple on pizza, it tastes amazing and I don't understand peoples beef with it? Chocolate is amazing, I have no issue with gender reveals (I mean, if it was me, I wouldn't have a WHOLE PARTY for it though, that's a bit overkill) and I love milk. Arguably yes, some eyebrows you see on Instagram are a bit much. But I do generally like bigger, bushier eyebrows. 1. Pineapple is my favorite topping, but I haven't had it in a long time because no one else I know likes it. 3. Had a reveal party (wasn't my choice). Diaper parties are great though - got a bunch of friends to come out and didn't have to buy diapers for the first 8 months. 4. Thankfully, I don't know. I basically use Instagram to edit photos and store them personally. 5. There are 3 gallons of milk in my fridge. I love cereal, and am not going to put orange juice in it (swear I've seen it). Ooh, a diaper party seems like a great idea - very practical!